Is it possible to have a system that does not fail? What is the definition of not failing? Walking away with one unit profit or 100? The reason I'm pondering such questions is because I have now reached spin 14800 using my system without a BR loss. There is a possible scenario that I worked out that could happen that would wipe my BR in half - this has never happened. Am I just getting lucky? Is this sequence from hell appearing when I've shut down my computer and gone to bed? I was so curious I started manually retrieving the previous 500 spins from the table history each day before I began play - not found this dreaded sequence. The only time when I have lost any part of my BR is when I think to myself, "surely my system is about to fail, I better put a large random nonsensical panic bet on" Everytime that has happened and I've lost, I've continued virtual play and realised if I stuck to system I would of never got about a 64U progression after 10 losses. I have began writing a PDF of what I do to win, and will release it when it's ready. What I find most surprising is that my system is based on physical uncertainties that I studied when getting my masters in physics. I'm using probabilistic expectation combined with linear algebra, the same principles that I use when calculating the expected position of an electron in space time. Hopefully none of you will think I'm crazy for this post, but I just wanted to share my experience so far. Do you bet on every spin? If so, 15K spins is quite impressive. It would appear that a simple doubling of stakes should recover easily. You can look at past spins online? From what I have read so far your approach seems to be sound. Your pdf will certainly be interesting reading. Reyth makes a great question. Did you observe or bet on each one of 15K spins? The definition of a winning system is a reason for too many misunderstandings. Everyone's expectations are different and many expect the impossible. If you can almost (there's never 100%) consistently, on average, make $10 profit in under an hour with less than 1K bankroll, then you definitely have a winner there. Even if you can make $10 within 2 hours with 2K bankroll you have a great system. Because this means that if you increase both your bankroll and playtime you can exponentially increase your profit, playing more time with higher value chips. Where do you play? Online, B&R casino, airball etc.? There is always a sequence from hell. Neither you nor anyone else can avoid this. You don't have to search past spins to find it. Just write down the numbers that would make you lose bet after bet. Then look at this sequence and ask yourself does this look impossible? Chances are that it wouldn't look too strange to dismiss it as impossible. This however does not mean that all systems are useless. What this means that there is always the chance to go bust! Like there is always the chance for something totally unusual to happen in our lifes, like winning the lottery. There is always a theoretical chance. The reality is that most people don't win the lottery. It's the same with a great system. there is always the chance to go bust, even if you had the best system ever. A good system can minimize the chances to go bust but can't prevent it with absolute certainty. Apologies for the delayed reply, and many thanks for the responses. I've only managed to get 450 spins in this week, but as usual no fail. Yes when I begin a session I can bet every spin. I start every session the same - sit down and play as it doesn't make a difference for me to look at previous spins. Previous spins (for me) only become important when losing. The reason I say this is because of probability - and more importantly, expectation. I think the importance of probablity vs expectation is not often expressed strongly enough in roulette discussions. All roulette spins are linearly independent of one another, the probablity tells me how much of a random chance do I have to win a particular bet. Expectation, however, tells me how likely an average event is. When I bet, I load up my excel table and start recording my numbers for my own benefit aswell as betting. I complete a full 100 spins before ending a session, usually betting on every spin. I only play on live online tables and yes for the past three months it has been 15200 spins using real money. I agree Kav, a sequence from hell is always just around the corner and can ruin a well earned BR. 32,2,7,6,28,31,0,10 was an unusual one for me today as it provided me with 8 losses in a row, still I survived this with a maximum stake of 16 units. I like your optimism when it comes to strategies Kav, I feel exactly the same way. It bugs me when people enter roulette forums and denounce all strategies as failures because of the HE. I truly believe that the HE has no bearing on my system at all. 0 can come up all it wants (I've encountered 0-0-7-0-33-0 in the last week). I've had a lot of questions regarding what I'm doing with my method, I'm currently writing my pdf and will give it to everyone ONLY when I've reached 25,000 live spins. If I reach this value without a BR loss then for me, I have achieved what I set out to do. The last thing that I would want to do is just be "lucky" and tell everyone my method for someone to go on and lose their cash. I've been playing roulette for 7 years now. During that time I've won big and lost big. It was only through very careful study during analysing the probablities of physics that my idea came to me. To give people something to think about in the mean time. If I was to ask Reyth to correctly tell me the next 7 numbers of my roulette game, how many do you think he could get? What's the expectation of correctly guessing 7 numbers, 7 times in a row? This really is a key point here. Also, as a side note I always play inside bets, however I have been messing around with a refined outside bet system using my method and it's working well - albeit my stake fluctuates a bit more rapidly. Best of luck for tonight , Cone. You bet 7 numbers each time ? You once bet 16 units on how many numbers - 7 ? What size of bankroll did you use for this ? If you don't use prior numbers to choose your numbers , what do you use ? Incidentally , if I had been at your table when those 8 numbers came up I would have won 4 of 6. I use the 2 last numbers to indicate what I should bet on the next 2 spins and I don't use progressions . Thanks for your feedback scepticus. I don't always bet 7, as I don't always have to. I used 7 as an example because 7 is what I started off studying before refining my system. If I stuck to 7 numbers I would lose in the long run according to my tests. By the time I got to 16 units, I had it spread across four corners. What I'm trying to get at is the probability versus expectation. If I could correctly guess 7 numbers, I wouldnt be using my system, I'd be using paroli. When I start off a session, the prior numbers mean nothing, I use probability until my first loss. In fact, you can use any system you want to get a few units until your first loss - it's how you get the loss back 100% of the time that is key here. Those 8 numbers, I have countless systems that could of made several units from those numbers, but in the long run every one would go bust. I'm in this for the long haul. Two weeks ago I had a free day and played 800 spins without any loss of bank roll. Another 100 spins done up 47 units. that was a good run, its not always that high..
Grats! I believe I can solve your riddle but I need to attend to an important appointment. I of course agree that the key to all systems is the recovery method. Oh hey, a quick update about the HE. The only way the number zero can be concretely tied to the HE is if one is only playing outside bets or will never bet the zero on the inside (and will bet every other number except the zero). The true definition of the HE however, is the unequal payout to the total numbers available for betting. Therefore, for your system to not be concerned with the HE, you need to consistently show profit at the end of every session; your system earnings are provably greater than the cost of the HE. All of us however, are and will be, affected by the HE on every spin. EDIT: Back. You are asking me to get 7 spins in a row correct! This is on the order of impossible and will not likely be seen in an individual lifetime. The answer is (1/37)^7 which is 0.0000000000105339 or 94,931,601,781 to 1; 94 billion, 931 million, 601 thousand, 781 to 1. Or have I misunderstood and you want me to then perform that 7 times over!? If so that is 664,521,212,467 to 1; 664 billion, etc. Instinct says that if you have a rolling 7 numbers on each spin, you eventually will receive a set of numbers that must hit or the odds will exceed 664B to 1. So we assume the maximum total numbers spun is 49...? I thing I know though, is that it is far more likely than 664B to 1, to get 37 unique numbers and simply playing Quads on the last numbers spun will lose far more commonly than 664B to 1. Therefore in order for your system to work, you must have discovered an actual bet selection (specific numbers based on the random sequence) that will hit far more commonly than their native statistical chances. Your discussion of linear algebra in connection with probability-expectation and how it correlates with guessing how an electron will move, makes my mind spin with joy! A way to choose numbers more accurately than 1:37 per number chosen. Does a computer RNG use electrons to generate random numbers? I am sure it does. In the case of antisymmetry, solutions of the wave equation for interacting electrons result in a zero probability that each pair will occupy the same location or state. This is responsible for the Pauli exclusion principle, which precludes any two electrons from occupying the same quantum state. This principle explains many of the properties of electrons. For example, it causes groups of bound electrons to occupy different orbitals in an atom, rather than all overlapping each other in the same orbit. If we can literally cross out even small sections of the felt, we have an undeniable edge that is like owning our own mint. electron determines the orbital it occupies, and the color reflects the probability of finding the electron at a given position. Of course we all have thought of this but what it results in, is simply betting the sleepers, because both will show greater probability and a decreased performance versus expectation. The only way to avoid this trap is to come up with a new way to determine probability and it would have to based on this geometric-algebraic formula that you are using? If there was a way to assign "energy levels" to each number in roulette and then demonstrate a correlation between those figures and the probability of each number appearing AND this differed from the "standard" way of viewing probability, this could allow us to beat roulette through bet selection. 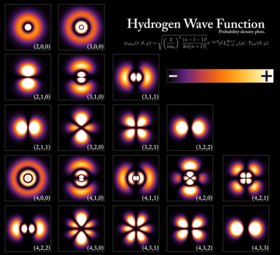 Do electron energy levels fluctuate and thus cause them to occupy different orbitals? If the wheel was like an atom, I wonder if every number appearing once every 37 spins would be its center? However, a number's "orbital" would be the tracked performance of that number over a series of spins, where its energy could be graphically depicted as in the above image. The "atomic orbital" of the number 17 over the last 49 spins. Every number on the wheel is like an electron spinning around the atomic nucleus of expectation. Don't download the software its kind of messed up. I will fix it. If a number appears with a very slow orbit, the chances of it repeating that same orbit or achieving an even slower orbit is statistically reduced. Like Thomas Lear I look forward to reading your PDF . It seems that you are betting 4 corners using a betting progression . Perhaps you will also tell us the size of your bankroll ? What should be concluded from a "particle physics" approach without any instrument (except his brain) in front of a roulette table? The problem is that physics is a "hard science" and human facts are analyzed with the "soft sciences" (according to the consecrated expressions). The human factor is very variable in front of a roulette table, a pretty woman who passes, a player who jostles us or who comes to talk to us ... How can our brain become a laboratory with red and black particles ? Some players use random sequences generated by computer. This seems to be an "acceptable" chance for them, to deduce the numbers to play on a table (eventually on any table!). In reality, every conceivable technique has no control over chance. Besides Cone1986 said in his last message "Variance will ruin any system, no matter how good you think it is". This is true if we have not identified one or more phenomena that no longer belong to "complete chance [hazard]". There are a number of techniques that can increase the benefits of a winning method. But on a losing method (-2.7% or -5,4%) these same techniques don’t bring any interesting improvement ! It seems that choosing numbers according to a "quantum thought" is more like a technique in the face of a complete hazard, because there is no identified phenomenon to say that the technique will choose such spin or other spin at the right time. A phenomenon has a beginning and an end. If this is not identified, we don’t know if a particular phenomenon exists. A "quantum thought" is likely to be comparable to a random sequence generated by computer, so a technique that cannot be a winning method in itself. In addition, a winning method proves that flat betting brings a greater profit than progressions. If "quantum thinking" could be a winning method, it could win without progression. If this isn’t true, then it is a technique (since a technique alone cannot win). For centuries, players have been looking for techniques without looking for chance phenomena. This is the main reason for their failure and ruin. Personally, I know the combinatorics for 25 or 30 years. But this technique is effective only with a good method. Kimo Li also talks about combinatorics on the net, but the presentation of his 2 books does not speak of a phenomenon that we can exploit with its combinatorics. So his books are only sold for 18$ and 20$. There are few authors who talk about combinatorics, the oldest I know, it was 195 years ago! The subject isn’t new, like almost all the techniques of today. The authors' books are full of techniques, but the study of phenomena remains a very secret domain. It's the secret of roulette to win, the way to the Grail ! This can be my point of discussion, dear MickyP. "The way to the grail" is a wink for the topic author and for players who use the word "grail" to define roulette success. But there is a whole other depth in these few words. I do not mean to reach the grail but to go "towards". What matters is not the goal but the path accomplished. This is the true gold of all initiation. For example, the yogi sets an unattainable goal, but he makes efforts to reach it! Gold or the true grail on roulette is philosophical. Our life experience with roulette must bring us knowledge and transform us. I understand, MickyP that you think we cannot win against roulette. So, for you the "grail" does not exist. To be certain that we cannot win, we should know everything about roulette! It's nothing if you are right or wrong to think that. The important thing is to make the path by "believing" ! I see you have researched Kimo Li. Have you bought his books or gathered information about the book from the net? I am asking because you had stated you don't know anything of Kimo Li's work. Kimo Li was deliberate on how he presented his material in his books. It's full of techniques as you have stated. He does explain his phenomena through his lessons. But, there is a price to pay, all totaling 36,000.00 to complete all three stages of his curriculum. The question is, is it worth spending 36,000.00 for information leading to "the way to the Grail?" Some would argue that is too much. Is it?